Your circle quilt looks like a tute I found on a blog. I am itching to make one. Looks great! 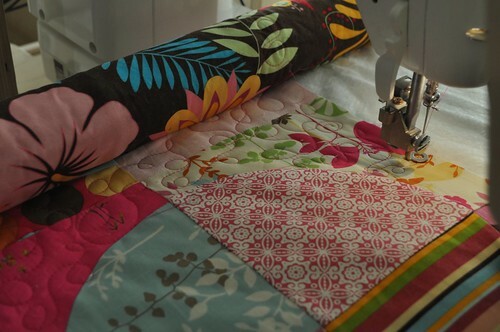 Oooo your quilting is beautiful! I love the loopy carnation flower quilting in the circles! Absolutely gorgeous! that is so beautiful! I just love it, and the quilting is great too! I love your "Circle Quilt". Scrappies are my most favorite and I'm very partial to curved lines. The quilting looks great. Beautiful! I just love your circle quilt! I am just beginning to trybfree motion quilting and yours looks fabulous to me! Great job! Oh how pretty your circle quilt is! And what a great job you did on the quilting! Wonderful finish - congratulations! I love the quilting in your circle quilt! Beautiful work! oh my goodness how i wish i knew someone, anyone with a long arm i could use. you are a lucky lady. and it looks beautiful. Wow, your circle quilt is amazing. Love your quilted carnation type flowers in the center! 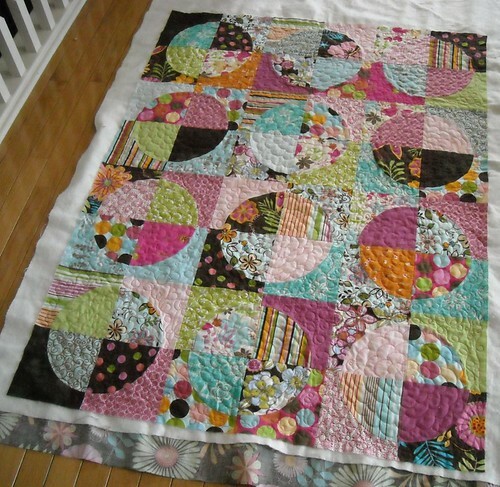 I love how your circle quilt is quilted it is amazingly awesome! 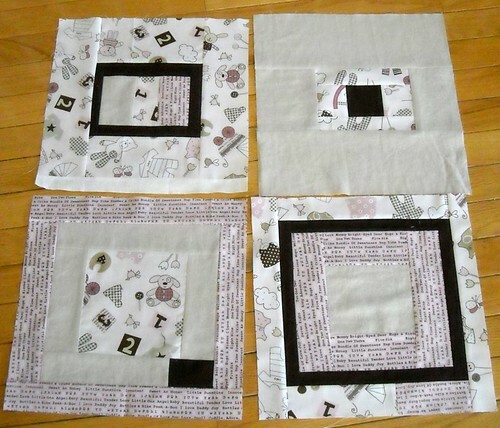 the new quilt squares are just too fun! Vicki! I love your fabric choices on this quilt! That design is so cool. 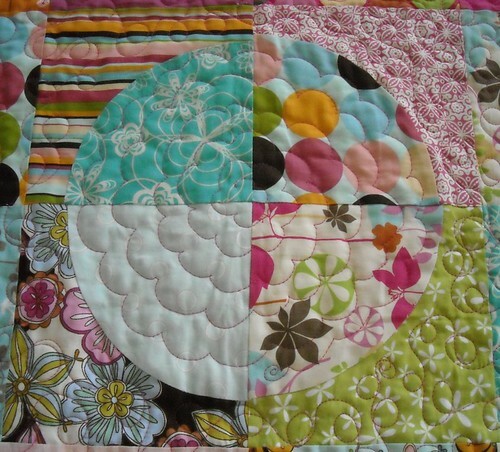 AND I LOVE the flower quilting in the circles, so cute! What kind of machine do you have to quilt on? You did a great job on the quilting. I like the design you chose for the circles. Well done! 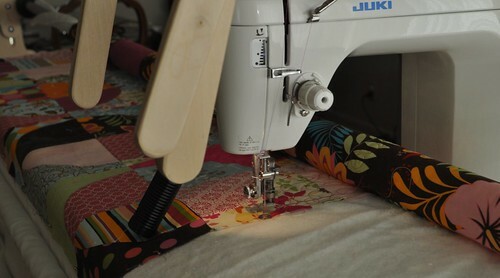 I love that circle quilt...BTW, I have a juki and love it for quilting...but I have it in a table. i thought i'd been a follower of yours for a long time, but just figured out today i wasn't, so...now i am!! LOVE this quilt, vickie--your blog is one i come to often to see what cool things you're doing and your great tutorials. i've got to try one of these circle quilts--hopefully won't start until i've finished a whole bunch of others i'm doing though!! have a great day! sorry VICKI--i hate people misspelling my name! my excuses are old age!! my forgettery genes kicking in!! and several friends with several variations. i always think of you and lynnie in provo in that apt. so glad you've been friends since that time. Love the carnation-y flowers in the center of your cirlces, so cute! Really interesting quilting. Love the project. I love how you quilted your flowers in the circles very cute Vicki!